Home › Home and Kitchen › Nutrichef Pksm240Bk 3-In-1 Digital Electronic Soup Cookersoy Milk Maker Blend..
Nutrichef Pksm240Bk 3-In-1 Digital Electronic Soup Cookersoy Milk Maker Blend..
Quick & Easy Operation: Make Soups, Juices, Mixed Drinks & More - Make it Smooth or Chunky! 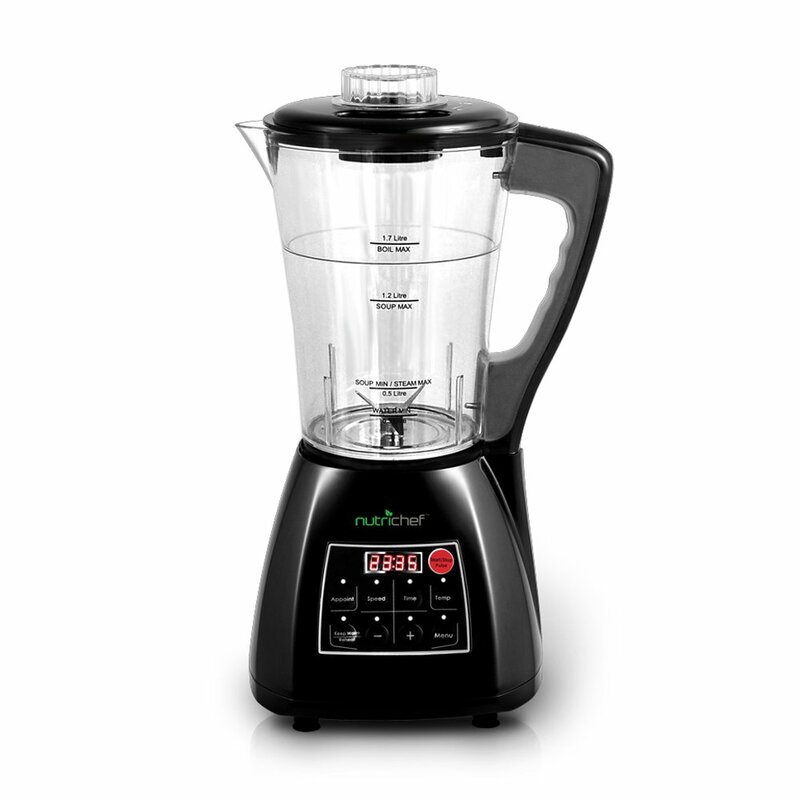 Style Name: Black The NutriChef 3-in-1 system combines a Soup Cooker, Blender & Drink Maker allinto one convenient unit. Simply add your ingredients for instant food prepability -- blend, mix, chop & cook! It makes everything from sauces, soups,desserts, drinks & more! The large capacity easy-pour mixing container holdsyour food while you set adjustable blending speeds and temperature settings.Make it smooth or chunky! The integrated blender with pulse ability can createa chunky & meaty soup for dad, then it can whip up healthy & nutritious fruitsmoothies for the kids! Additional features include front panel touch buttoncontrols with LCD display, reheating 'food warmer' function for soup prep andautomatic power-off safety overflow sensor. It's all housed in a high-powered900 watt convenient countertop design for blending your ingredients in up to15,000 RPM! Enjoy versatile & convenient food prep ability with the NutriChef3-in-1 Soup Cooker, Blender & Drink Maker.